I used to be a very convivial, intelligent, thoughtful person. At one point in my life I wrote "Thank You" notes. At one point in my life I had no inkling of the non-hyperbolic nature of the term "bouncing off the walls." And yet, I find that way back then, before children, my house was a mess, and I rarely managed to finish a project. Why is that?? I find a certain poetry in the odd truth that as I lose my marbles, I seem to be finding them. I have always wanted some kind of Advent thing. A tradition. A practice. A drumroll for Christmas. You know, a thing. And last night we finally set up our thing. 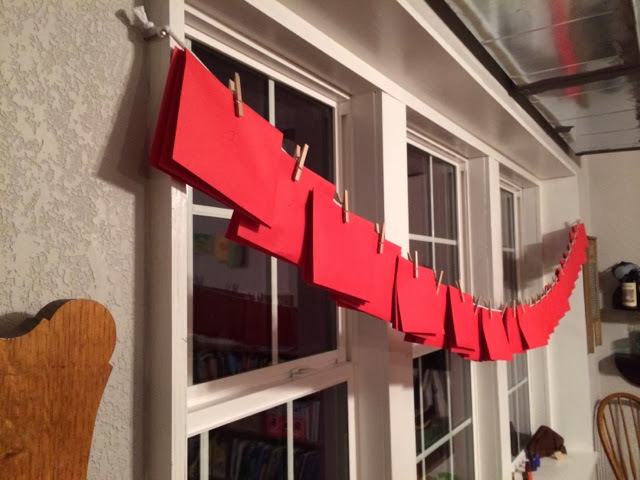 We filled 75 envelopes with puzzle pieces and hung them from a super awesome string in our family room. I can't even begin to tell you how Pinteresty it is!! Each day each child will get four pieces and by Christmas, voila!! A puzzle. So it's a moderately lame thing, but it's our thing and every family needs a thing.